St. 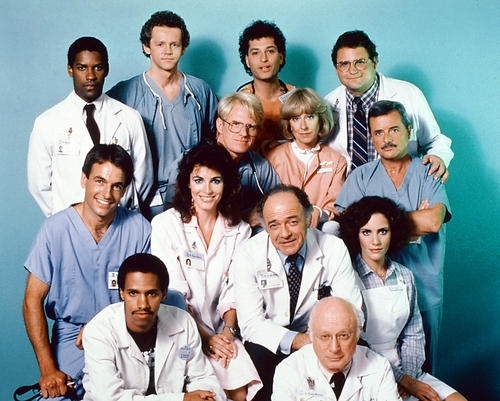 Elsewhere premiered and many dubbed it Hill Street Blues in a hospital. But creators Joshua Band and Brad Falsey went on to prove to be much more than Steven Bochco wannabes. The series lasted for six seasons from 1981 through 1988 and earned numerous awards for the cast and crew. The show launched pop culture games in which people tried to guess the film and television references often found within episodes and had a series finale that has gone down in TV history. In addition to Lloyd, the staff at St. Eligius Hospital included Ed Begley Jr., William Daniels, Howie Mandel, David Morse, Christina Pickles, Denzel Washington, Ed Flanders, Stephen Furst, Bonnie Bartlett, Mark Harmon and many more. Here are a few fun facts about St. Elsewhere. 1. Dr. Daniel Auschlander was the Chief at St. Eligius but in the pilot viewers found out Auschlander did not have long to live. Lloyd was originally cast for only four episodes, but because producers liked his work, they kept Auschlander around. Instead they put the character through grueling chemo treatments and a period of remission, which lasted until he succumbed to liver cancer in the series finale. 2. Ed Flanders played the part of Dr. Donald Westphall. But before he was handed the role, producers had offered it to a Hal Linden of Barney Miller fame. Linden had just come off eight seasons of playing the sitcom police captain and wanted a break from TV, so he turned it down. 3. William Daniels, who played Dr. Mark Craig, and Bonnie Bartlett, who played his wife Ellen, are a married in real life. The couple has been together for over 61 years. They met in drama school at Northwestern University, married in June of 1951 and have two sons, Michael and Robert. 4. The a building used in the opening credits to represent St. Eligius was actually located in Boston, Massachusetts, at 11 East Newton Street. Built in 1868, the Franklin Square house currently serves as elderly housing. In the past it was used as a hotel and as part of the New England Conservatory of Music. 5. Byron Stewart played the orderly Warren 'Cool' Coolidge. But it wasn't Stewart, or Coolidge's, first time on a TV series. The actor portrayed the same role on The White Shadow from 1978 to 1981. The story goes that after injuring himself playing hoops, Cool took a job at a hospital in Boston. 6. One episode featured a psych patient named a Elliot Carlin played by Jack Riley. Riley played the same character, Mr. Carlin, on The Bob Newhart Show for six seasons of Newhart and reprised the role on St. Elsewhere in this 1985 episode called Close Encounters. 8. In a Season 5 episode called Once Upon a Mattress, Dr. Fiscus, played by Howie Mandel, awakened from a coma after being shot. Dr. Axelrod (Stephen Furst) and Luther Hawkins (Eric Laneuville) tried to snap Fiscus out of his severe depression by doing a bit they saw a comedian do on TV. They put surgical gloves over their heads and inflated them by blowing through their noses. The comedian on TV was Mandel himself, who came to fame performing the rubber glove bit as a stand-up before being cast on St. Elsewhere. 9. During Season 5, St. Elsewhere had a nod to one of William Daniels' most beloved roles, playing John Adams in 1776. When his character, Dr. Craig, visited Philadelphia with his wife, he commented on the weather by singing a line from one of the film's songs, "Sit Down, John!" that stated, "It's hot as hell in Philadelphia!" He also recalled that in med school he was referred to as "obnoxious and disliked," the exact terms used to describe John Adams in the patriotic film. 10. Dr. Robert Caldwell, played by Mark Harmon, was the first network TV regular character to have AIDS. Harmon left the series at the end of Season 4 and Caldwell's death was memorialized in an episode during Season 6. At the service a nurse noted that the doctor thought he was the sexiest man alive. Harmon had appeared on the cover on People magazine in 1986, dubbed People Magazine's Sexiest Man Alive. 11. In a crossover episode Dr. Westphall, Dr. Auschlander and Dr. Craig stopped by the Boston bar Cheers for a drink. The episode recalled a statement barmaid Carla (Rhea Perlman) had made years earlier on Cheers that she had delivered one of her eight children at St. Eligius. The episode also revealed that Norm (George Wendt) had been Auschlander's accountant and had at one time put him into some hot water with the Internal Revenue Service. 12. In one of the most memorable finales of all time, Tommy, Dr. Westphall's autistic son, put down his snow globe depicting St. Eligius Hospital. At that moment viewers realized the whole series, and all its characters, existed only in Tommy's imagination. It set off a lot of discussion, theorizing and even college classes about the "Tommy Westphall Universe," which assumed that if St. Elsewhere was just in Tommy's mind, so were the other shows that crossed over including Cheers, Newhart, CSI: NY and Homicide: Life on the Street. Taking into account all the interconnected offshoots of the crossover shows, the running total of Tommy's imaginary series stands at 280. 13. St. Elsewhere was an MTM production and so at the end of every episode the company's logo with Mimsie the kitten in the gold circle would appear. However, on St. Elsewhere episodes, Mimsie would be decked out in a cartoon surgical mask and scrubs. In the finale, producers used Mimsie to signify the end of the series when she was seen laying on her side with an EKG beeping until she flat lined in the last few seconds of the credits. 14. In the series finale, St. Elsewhere ave a nod to another MTM show whose last episode also went down in TV history books as one of the best of all time — The Mary Tyler Moore Show. Just like the MTM newsroom staff, the employees at St. Eligius reenacted the WJM group hug, including the shuffle in a cluster across the room to get the Kleenex box. This episode also included references to M*A*S*H, The Fugitive and The Andy Griffith Show. 15. During the course of any given episode, numerous doctors were paged over the hospital loudspeaker. Occasionally writers used the names of TV characters, actors and even family and friends for these fictional physicians. Several times they used the name of the daughter of the series' Executive Producer Bruce Paltrow when they paged Dr. Gwyneth Paltrow. The young girl was just ten years old when St. Elsewhere went on the air and would not have her first acting role until three years after the show ended. 16. St. Elsewhere helped launch the careers of not only several of the series' leading actors but several guest stars as well. Up-and-coming stand-up comedian Howie Mandel shot to fame playing Dr. Wayne Fiscus, David Morse had only three professional gigs before signing on as Dr. Jack Morrison and Denzel Washington was also a newcomer when he became Dr. Philip Chandler. Also mixed among the hundreds of guests stars that portrayed patients, nurses, doctors and more were future Oscar winners Helen Hunt and Tim Robbins, as well as, unknown actresses Patricia Wettig and Jane Kaczmarek. 17. St. Elsewhere was a good training ground for many of the actors who went on to work in the medical field on other TV series. Ed Begley, Jr. played a doctor almost 20 more times including his most recent turns as Dr. Van Waal on Common Law and Dr. T. Pike on Rizzoli & Isles. And William Daniels played Sandra Oh's superior, Dr. Thomas, in her new position at the Mayo Clinic on Grey's Anatomy. 18. Over the course of six seasons, St. Elsewhere received 62 Emmy nominations. Although it got a nod every year for Outstanding Drama Series, the show never took home the big title. It did however win 13 statues including Lead Actor (William Daniels and Ed Flanders), Supporting Actor (James Coco), Supporting Actress (Bonnie Bartlett and Doris Roberts), Director (Mark Tinker) and writing for the episode called The Women. 19. Even after St. Elsewhere went off the air, the crossovers continued. It shared characters with Homicide: Life on the Street on several occasions. In 1998 Alfre Woodard made an Emmy-nominated turn as Dr. Roxanne Turner, who performed an assisted suicide by injecting a lethal dose of morphine. Ed Begley, Jr.'s Dr. Ehrlich also appeared on Homicide: Life on the Street, but mostly in name only. One of the detectives on the show talked about being treated for his bad back by Dr. Ehrlich and in the series finale Begley made an on-screen appearance in the role. 20. As part of a big NBC 75th anniversary celebration in 2002, four actors from St. Elsewhere reunited on Scrubs during its first season on the air. Ed Begley, Jr., William Daniels, Stephen Furst and Eric Laneuville played doctors who were sent to the Sacred Heart hospital after getting sick at a medical convention. Other series to cross over during the weeklong event were Frasier with Cheers, Hill Street Blues with Third Watch and Quincy with Crossing Jordan.